As published in the Journal of Hospital Administration 2016, Vol. 5, No. 1. As part of its national privatization strategy to diversify the economy, Botswana has started outsourcing nonclinical services at seven public hospitals. Hospital managers are signing contracts without knowing whether outsourcing offers better value for money than “insourcing”. The objective of this study is to assist hospital administrators in making evidence-based outsourcing decisions. 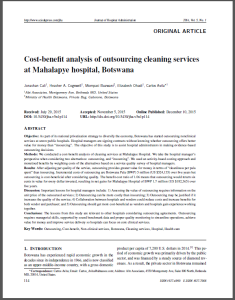 HFG and the Botswana Ministry of Health conducted a cost-benefit analysis of cleaning services at Mahalapye Hospital. We take the hospital manager’s perspective when considering two alternatives: outsourcing, and “insourcing”. We used an activity-based costing approach and monetised benefits by weighting costs of the alternatives based on a service quality survey of hospital managers.